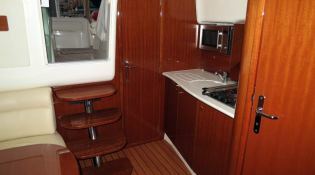 The GOA 4 is a motorboat, Jeanneau brand and Prestige 34 model. This boat is practically new. 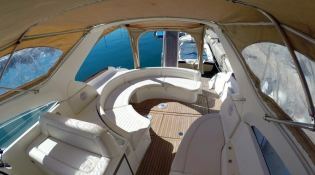 The GOA 4 is an ideal boat for exploring the island in a short amount of time, reveling in its marvelous sunsets, or enjoying the mornings in the crystalline waters of the Baleares Islands. As a day or overnight charter, the Prestige 34 is a very comfortable and versatile boat, with large outdoor space for eating and sunbathing, and an especially spacious main cabin. 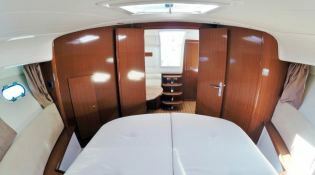 It has the advantage of consuming less that other boats of similar length. 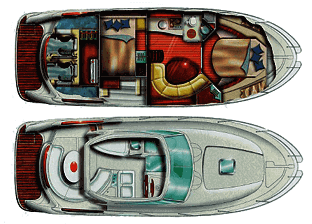 Its two diesel motors, although only 260 cv, allow a top-speed of 35 knots and a cruising speed of 25 knots, thanks to its deep V-shaped hull that lets it move through the sea with ease. 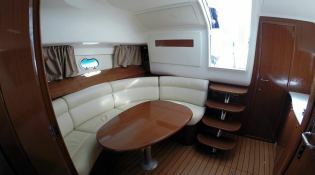 This motoryacht is available for yacht charter with a base price of 3 530 € (approximatly 3 981 $).